Be spoilt with epic accommodation in some of Bali’s best locations, visit ancient temples, experience stunning sunsets and amazing nightlife, learn to surf, spot wild Dolphins, learn about local life, discover all 3 beautiful Gili Islands, snorkel with turtles, trek to the summit of an active Volcano for sunrise and more! Check out our awesome itinerary below! You'll stay in some absolutely amazing accommodation on Bali Experience. Kick back and relax in fancy hotels, villas and beautiful beachside bungalows! When you land in Bali after your long flight we'll be at the airport to meet you and take you to the hotel. You'll have plenty of time to recover from your flight, chill out and meet everyone in your group. 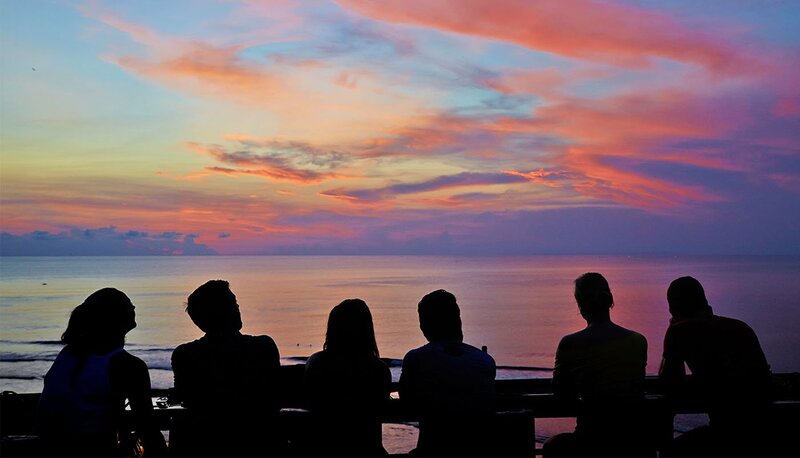 Experience the beautiful Uluwatu temple, chill out on the iconic Padang Padang beach before a sunset dinner and a taste of the best of Bali nightlife! 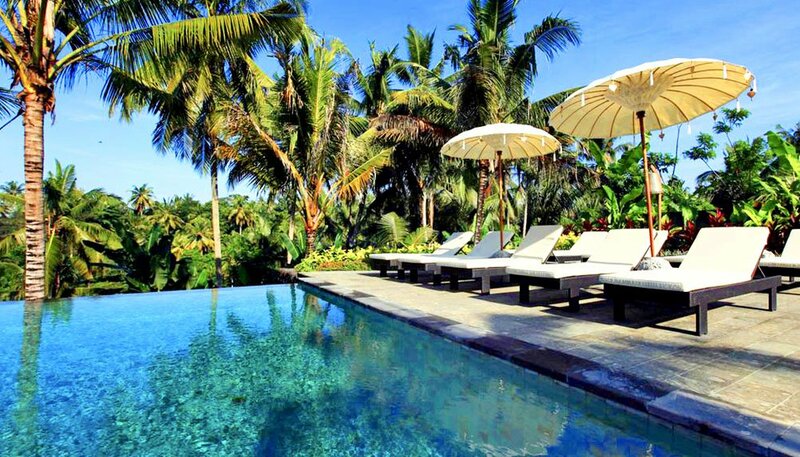 We'll head to the coast and experience the laid-back surf destination of Canggu. You'll be taught how to surf by local Balinese surf dudes in one of the worlds most famous surf destinations. Discover fascinating temples, epic waterfalls and beautiful rice paddies on your way to the amazing Lovina in the north of Bali. Day 5 we jump on a traditional boat and spot wild dolphins before learning first hand about Balinese life when we visit a local family. We travel by fast ferry to the stunning Gili Trawangan - a beautiful tropical island off the coast of Bali. 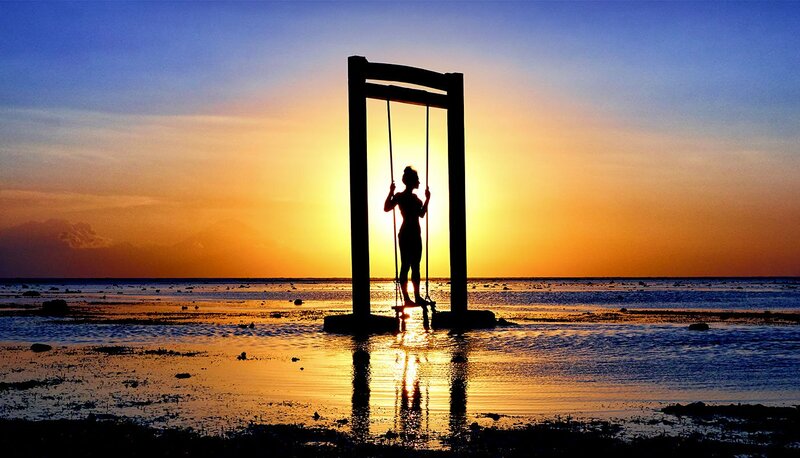 We'll check into our amazing beachside resort, explore the island by bicycle, relax on white sandy beaches, take in a gorgeous sunset including the iconic sunset swing! We'll travel by boat around all three beautiful Gili Islands, stop for a beachside lunch, snorkel in crystal clear water with a good chance of spotting some turtles! After a delicious dinner and island party we'll make our way to Ubud on day 9. Today you'll experience the famous Monkey Forest in Ubud. 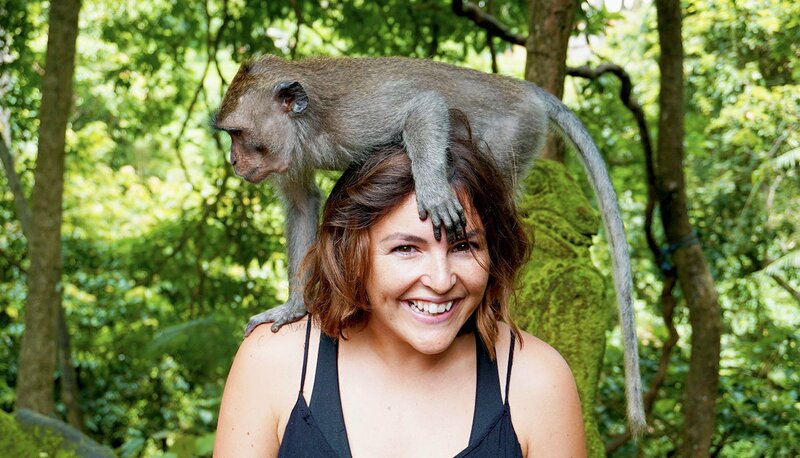 A fascinating temple home to hundreds to wild monkeys you can get up close and personal with! We'll then learn the secrets of preparing delicious Balinese food with a traditional cooking class. Trek an active Volcano for a once in a lifetime sunrise and enjoy breakfast on top of the Volcano! Then unwind with a relaxing and rejuvenating massage before heading out for your farewell dinner. Your epic adventure comes to an end on day 12. * All accommodation have either twin or double share rooms. If you're travelling solo and want your own room throughout, just contact us at time of booking to upgrade at an extra cost. You'll get an awesome Group Leader from the moment you step off the plane. They'll be there to provide 24/7 support during & after your trip, as well as help with all of your onward travel. We'll be there to greet you at Bali airport after your long flight and take you to the Guesthouse, and drop you back after your trip finishes. To download more detailed notes on our awesome Bali Experience trip click here. Bali Experience is one of our most premium group tours. You'll be blown away by how much you get for your money! Bali Experience has an average rating of 4.9/5 based on 165 customer reviews. Excellent tour! Met lots of lovely people and saw some beautiful places. Bali Experience was amazing! Morgan did a great job leading the tour. Would highly recommend. Amazing time. Would highly recommend for those who want to travel, definitely going on to do more of these tours!